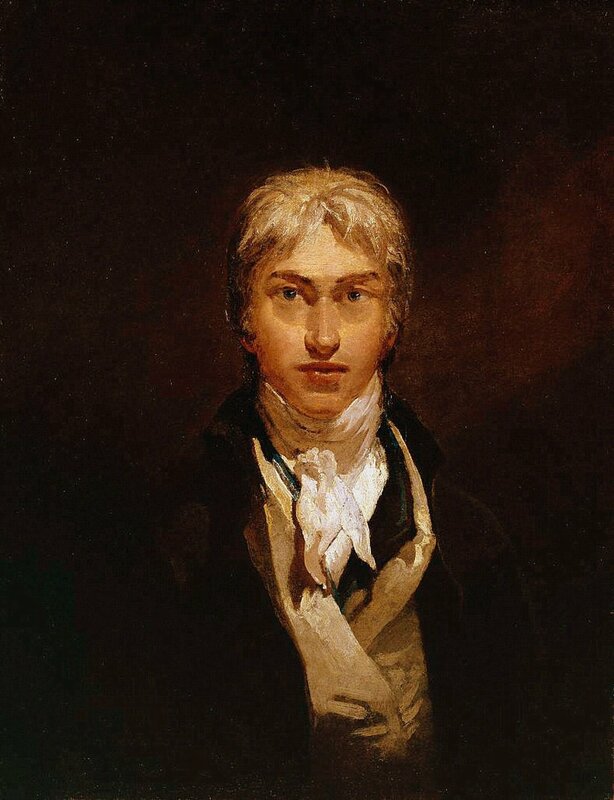 Joseph Mallord William Turner, the greatest of the English Romantics and colourists, (1775-1851) was born in London, a stone’s throw from the River Thames. His father (like Tom Kydd’s) was a wig-maker. 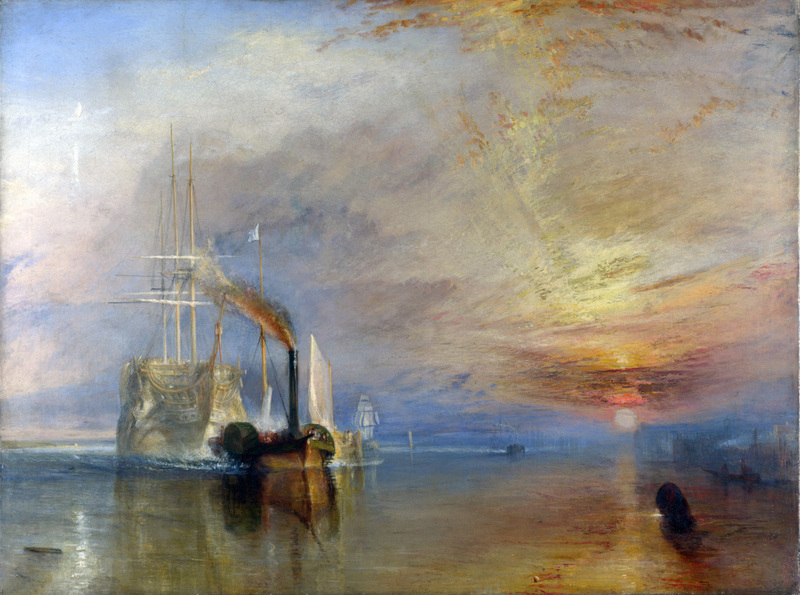 Although he painted many subjects, water would hold a fascination for Turner for the whole of his life. His seascapes range from peaceful early morning vistas of fisherfolk on the sands to incredibly violent storm scenes to experimental, impressionist creations. I particularly like his storms! 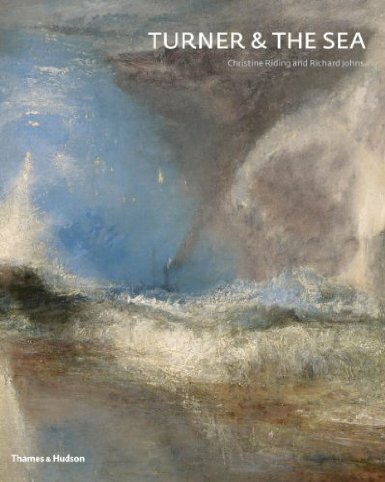 Turner’s work is valued not just for its intrinsic appeal but also as potent social or moral commentary. This is true of his iconic ‘The Battle of Trafalgar’, commissioned by King George IV in 1822. 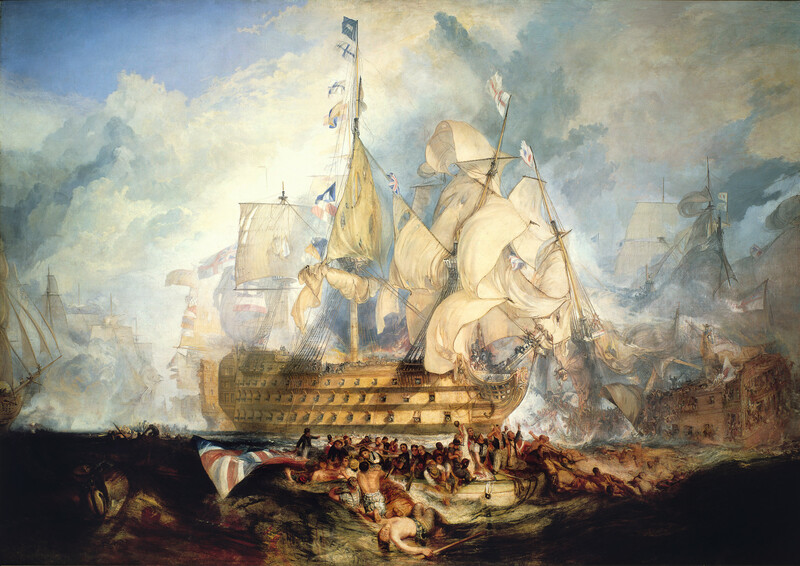 The painting combines a number of incidents from different times during the battle and some have criticised this as a departure from the historical record. But I feel that artists are entitled to reflect their feelings in their work and the message is clear – a glorious victory, yes, but the suffering was great and the cost to the nation was more than the death of a national hero. I was delighted to receive a review copy of a book published to coincide with a major exhibition at the National Maritime Museum in Greenwich. Entitled ‘Turner & the Sea’ it’s a magnificent nearly 300-page visual celebration of the great artist’s range and skill in his engagement with the sea. The majority of the 200 paintings in oil, watercolours, etching and sketches are by Turner but the book also contains works by a number of other artists who were influenced by Turner. As well, eight contributors to the book bring new scholarship to our appreciation of how Turner responded to the maritime art of the past while challenging his audience with new ways of representing the sea. A treasured addition to my library! I plan future blogs on some of the other maritime painters I particularly admire. The exhibition of Turner’s sea paintings runs from today until 21 April 2014. ← Cauls, Mary Carleton and the Chatham Chest! Have you ever had a close look at the fighting Temeraire painting and thought a few things are odd? Like the funnel of the tug positioned ahead of the tall mast, and the ship itself with so much of her rig still on even tho she would of been in ordinary before the final tow? Fighting Temeraire my all time favorite.